To this writer,who was introduced into railroading by the B&O and the Western Maryland Railway, it is perhaps natural to at first dismiss the Cumberland Valley Railroad. First and foremost, the CVRR sold out to the Pennsylvania Railroad, the nemesis of the B&O. And then there is its flat profile and the tame country the road traversed. 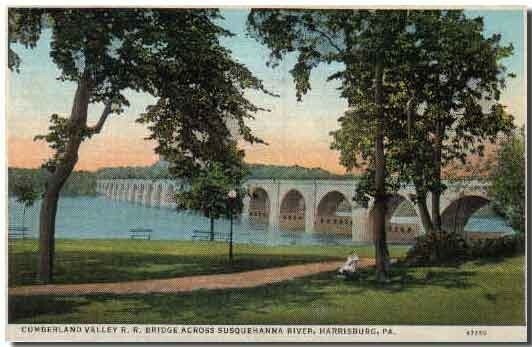 The CVRR did not conquer the Alleghenies like the B&O or WM, it did not forge into the wilderness like H.G. Davis' West Virginia Central and Pittsburg. And, a shallow reading of the CVRR's history seems to reveal a "big duck in a little pond" attitude in which this small monopoly put its interest ahead of the Valley in general. This writer's theory of railroads is that the best ones are the ones closest at hand. And it is true with the Cumberland Valley Railroad, the deeper one digs into its history and views its current operations, the more one appreciates this road. True, the PRR had a controlling interest from 1859 in the CVRR and in 1916 completely merged the road as a branch of the "Standard Railroad". But, the Cumberland Valley Railroad predated the PRR by decades and probably taught a thing or two to the PRR. The Cumberland Valley never "sold out" to the PRR, Philadelphians were major investors in the road from day one (much more than Harrisburg) and the PRR people gradually increased their interest by buying up stock for sale. The CVRR qualifies as a pioneer in American railroading with its start in 1837. Early roads learned railroading as they grew and CVRR contributed to what not to do by its early system of freight forwarders, independent middlemen who made up the train by supplying the freight, boxcars and a conductor with the railroad supplying the motive power and crew. Early high-wheeled woodfired locomotives also give the CVRR an aura of primitiveness. The CVRR first and foremost served the Cumberland Valley, a particularly lush portion of the Great Valley that runs from Eastern Pennsylvania to Alabama. The CVRR was considered to be a almost perfect measure of Cumberland Valley's production, everything moved by the railroad, in or out. But the CVRR had early dreams of extending west through the Tuscarora Mountains, Hother Hage's Southern Route. Indeed, early in its history it captured considerable passenger and freight traffic coming off Forbes Road (US Rt 30) and other western turnpikes. The CVRR kept its western extention dreams alive through the end of the 1800's by its South Penn Branch. 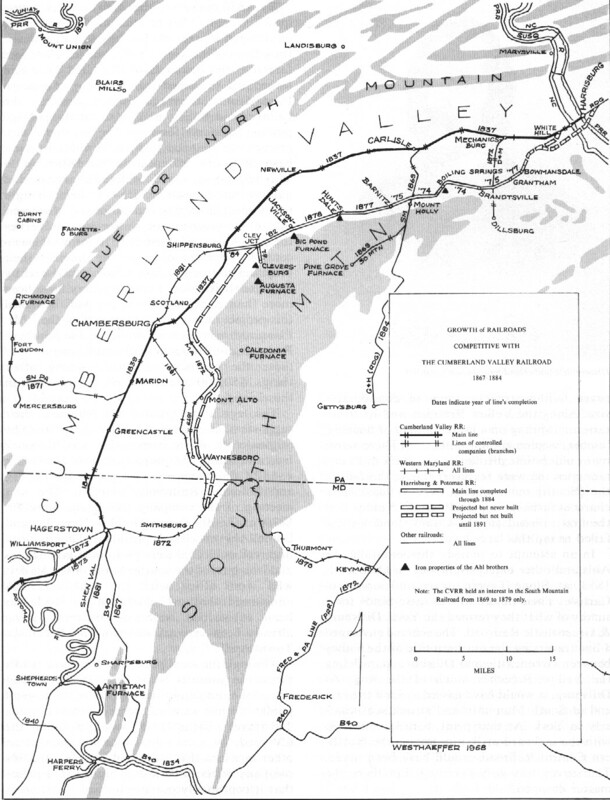 The Cumberland Valley was also a planned route to the Cumberland Coal Fields, the PRR planned to buy and fill over the C&O Canal, making it an extention of the CVRR to Cumberland Maryland. Adding spice to the mundane freight traffic was the iron ore branches, each an interesting history in itself. Here we find the Ahl Brothers and a host of other enterprising entrepreneurs. The Cumberland Valley Railroad was a part of Thomas Scott's Great Southern Route dream, for a time it was a link in a varnish passenger route from the South. And the CVRR was the major player in the Great Coal Push, an early 1900's PRR shafting of George Gould. 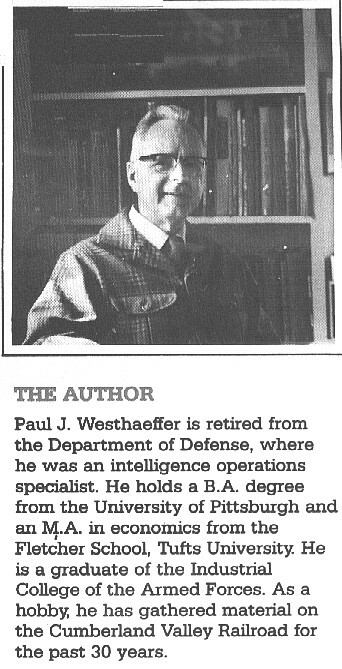 Much of the CVRR's history could have beenforgotten if not for the great work done by Mr. Westhaeffer referred to below. One test of the soundness of an early railroad is whether it is still around. Except for the portion from Carlisle to Shippensburg (this routing through Newville was strongly protested by George Roberts, the founding engineer), the CVRR's route is still in use. As it turns out, the Cumberland Valley Railroad does rank up there with the World's Greatest Railroads. Mr. Westhaeffer recounts that his interest in the CVRR started at age 2 when he rode from Harrisburg to Chambersburg and then over the South Penn Branch to Mercersburg. After his career in the Army, he devoted himself to this railroad and this book, which contains 10 maps and 200 illustrations. His book was the result of a lifetime of love and research.